Is augmented reality a mobile killer app? Augmented reality (AR) could be the killer app mobile marketers have been looking for. What is AR? 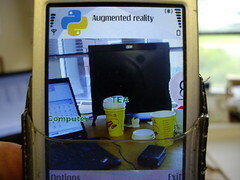 Simple: the superimposing of computer-generated images or text on an image of the real world, as taken by the camera of a mobile phone. A timely example of AR is the Wimbledon Seer app, which runs on Google’s G1 smartphone. It gives anyone in the crowd at Wimbledon “the ability to superimpose additional data about the match onto the court when viewed through the camera’s lens“. This data includes match information, news feeds and the location of refreshment stands, restaurants, etc. in the stadium. The video below shows Wimbledon Seer in action. Even if you’re not a big fan of the mobile phone, it’s hard to deny: this is pretty darn cool. The operators of Wimbledon aren’t alone in their use of AR. From Nike to the WWF China, a growing number of organizations are employing AR in their mobile marketing efforts. So is AR a game-changer for mobile marketers? Maybe. AR makes great use of the features and characteristics of the modern mobile phone to create an experience that’s uniquely suited to these portable devices. This experience is highly-interactive and highly-personal since the consumer’s surroundings are incorporated into the experience. But these things can be red herrings and some suggest that AR is more hype than substance. I disagree, but I do think that for brands to be successful, they can’t assume that the use of AR will work wonders by itself. Right now, AR campaigns can gain some traction simply because they’re cool. But once the initial ‘WOW factor‘ is gone and everyone is doing something with AR, brands will need to be far more thoughtful and strategic. The barriers to success will be higher for AR apps that are heavy on the sizzle but light on the steak. That means that brands will need to think about utility, not just novelty. The good news: it looks like there will be no shortage of ways for AR to deliver that utility. The Wimbledon Seer app provides a good example of what AR can do and highlights why AR could become one of mobile’s killer apps. Photo credit: epredator via Flickr. Google, a company that has built its success in search on the back of a superior search algorithm, is looking to humans as it makes search a bit more social with the launch of SearchWiki. SXSW is one of the key events in the digital world, when the great and the good descend on Austin for 5 days of panels, conversations and parties. This is my first trip to the event but according to SXSW old hands, this year is bigger than ever before (I can believe it, the list of talks is mind blowing). Well that didn’t take long. Premium cable network Showtime has just brought marketing to the Kindle. Starting today, Kindle users can download the pilot episode script for its new series “Nurse Jackie,” which stars former “Sopranos” star Edie Falco. Banners on Amazon and the Kindle store will promote the free download, according to an AdAge report. Once downloaded, the script is acompanied by calls-to-action including the broadcast schedule and encouragement to view the episode trailer on Sho.com.